Have you ever had to move a rose? Not just within a bed, but far from its bed? 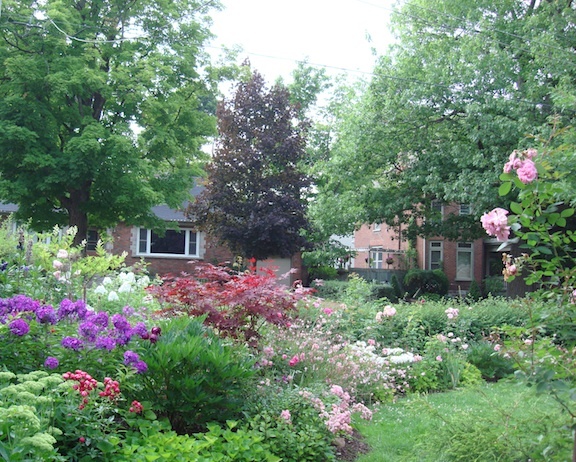 When we bought our home and renovated it - the process took much longer than we anticipated and the gardens had to be moved in the fall because moving our “stuff” would be when the ground was frozen. 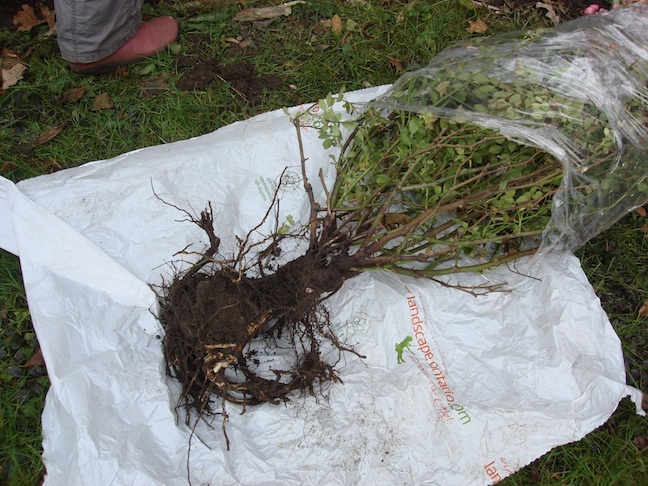 Most of the roses could be dug - carefully digging a wide swarth around the root to prevent cutting off too many small ones. They could be put into buckets or baskets and boxes to transport - unless in a moving van and then they would need better care- wrapping, moisture, and stem protection. SOIL TYPE: most soil types; needs little fertilization and good drainage. It will do well with slightly acidic soil. FLOWER COLOUR: most common is pink, but there are some polyantha roses that are white - I have one called “Medlund”. PLANTING: spring, summer (if not too hot) and fall - great for a hedge, or cascading over a wall or short fence. TRIVIA: I cut back wherever a stem encroaches on another; they make gorgeous bouquets and dry well…. Retaining their glorious pink colour all winter. 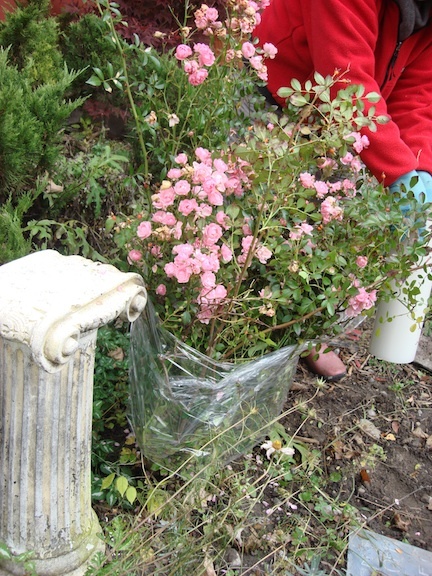 PERSONAL EXPERIENCE: One of my favourite, easy to grow roses. 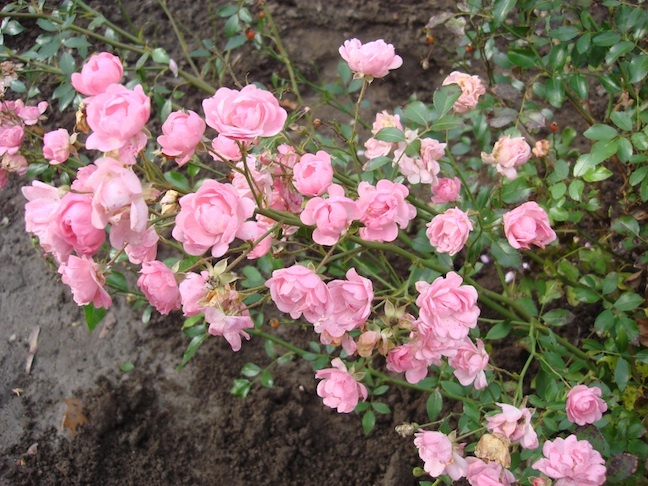 It is great in a border with tea roses as its spreading habit hides some of the bare stems. TOLERANT to BLACK WALNUT ? I doubt that most roses will tolerate Black Walnut…. But this could be one to try. 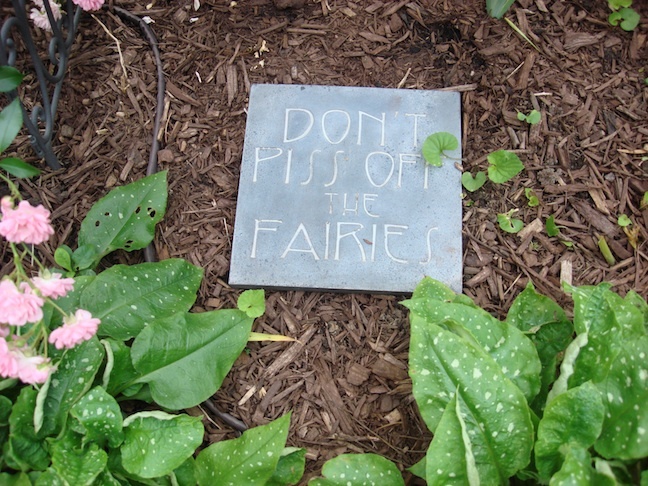 I do have some within 20 feet of the drip line that are hardy, but the Fairy needs more room than I have there - as it likes to spread its pretty wings. Its spreading habit and biting thorns, make it almost impossible to dig around. Even though it was almost 6 feet wide and nearly 4 feet tall, it was not late enough in the season to cut it back yet so I needed another way. Our movers had given us a roll of plastic wrap - used for wrapping the edges of furniture or mattresses. Perfect. 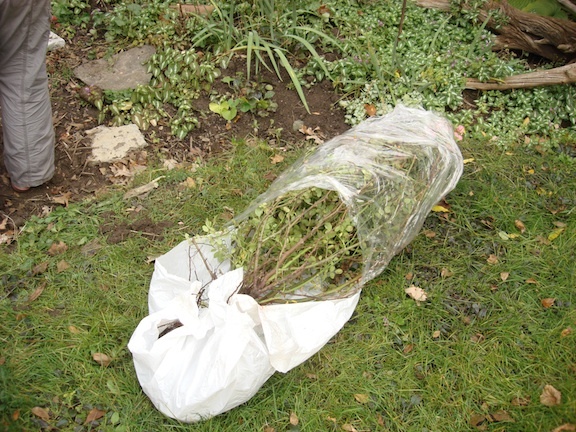 I had my trusty partner - gloved and prepared - hold up the outer branches of the bush while I began to encircle it with the plastic wrap. Once the wrap started clinging to itself, it became a bit easier and it was easy to pull the branches tighter without breaking them. I was able to walk around the bush while wrapping it. We laid out a piece of fabric and dug up the bush, placing the root on the fabric. 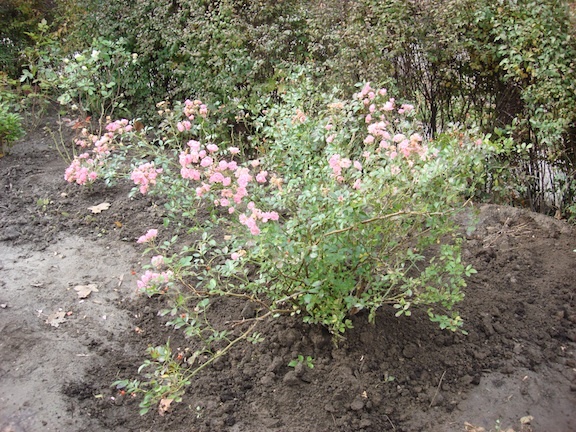 It is better to get as much soil with it as possible but in our case, this poor rose had been relocated only a year before so the root did not have many side shoots and was not bound to the earth in which it was planted. 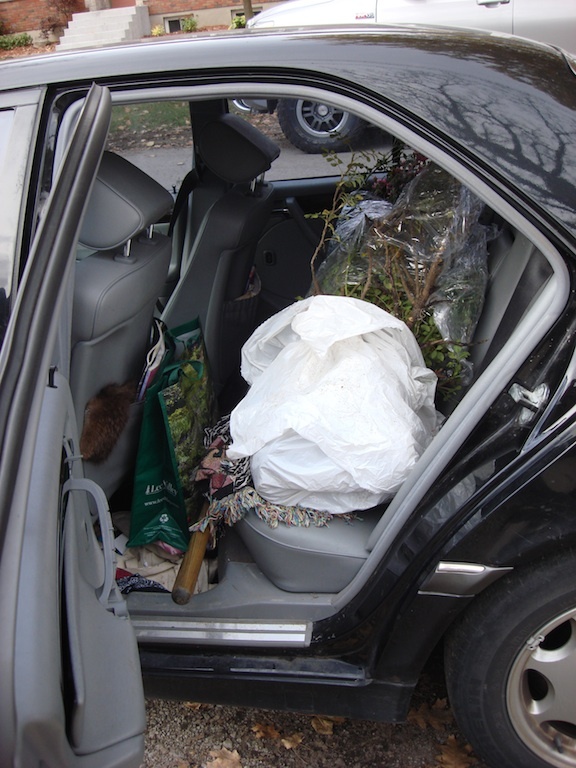 I then wrapped the root - mostly as it had to be transported in the backseat of my car. Fortunately, we were moving just around the corner…. When you find a great neighbourhood, don’t leave ! 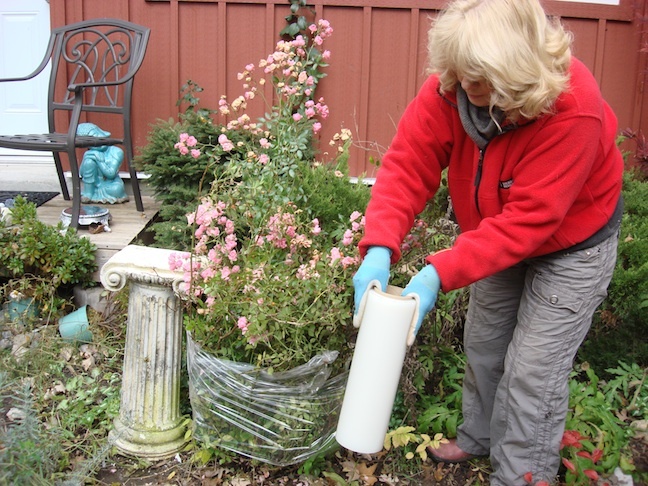 If your roses had to be out of the earth for longer than a few hours, they would need moist peat, or moss, or to be put into bucket of soil to transport. The longer out of the soil, the more care they need when planted. This rose actually split and became two. I was most distressed at first, but there seemed to be as many roots on both sides of the split, so I planted them both. They took. This rose is almost foolproof ! And, its second summer - now there are two.